The onset of the festive season witnesses most major car manufacturers gearing up for new product launches. This September, we expect to see three new car launches in the country that will be followed by a few other launches in the months to come. Read below to find out more about the upcoming three new car launches slated for the month of September in the country. Mahindra’s much-awaited MPV, the Marazzo, based on a distinctive shark-inspired design philosophy is slated for launch on 3 September. The company claims that the vehicle will offer a unique balance of smooth ride, agile handling, space and a quiet cabin. The MPV gets an intimidating front look with shark-teeth like chrome grille inserts. The rear section, on the other hand, is highlighted by the shark-tail like tail lamps. The vehicle also features a shark-fin antenna to complete its overall aesthetics. Although Mahindra has revealed that the Marazzo will be offered with a new engine option, the company has not spoken in detail about it yet. We believe that it might be a 1.6-litre diesel engine from the Falcon series that the company has been working on for quite some time now. The updated Datsun Go had been recently spotted on test in Tamil Nadu. In terms of changes, we expect to see new bumpers and other cosmetic upgrades. The top spec variant will be offered with alloy wheels and a touchscreen infotainment system. Under the hood, it continues to be powered by a 1.2-litre three-cylinder petrol engine that is capable of churning out 78bhp of power and 104Nm of peak torque. It will continue to be mated to a five-speed manual transmission. 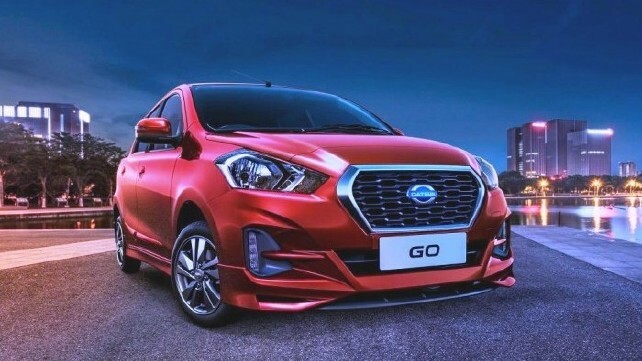 The extended version of the Go, the Go Plus, will be offered in a seven-seat layout. This time around, the MPV is expected to get similar upgrades as the hatchback variant. The new model is expected to revive sales for the company during the festive season. The vehicle will get fresh upgrades in the form of an updated front grille, a new bumper, restyled headlamps with LED DRL and LED tail lamps. Mechanically, it will continue to be powered by a 1.2-litre three-cylinder petrol engine that generates 78bhp of power and 104Nm of peak torque. The vehicle will get similar upgrades as its hatchback sibling.